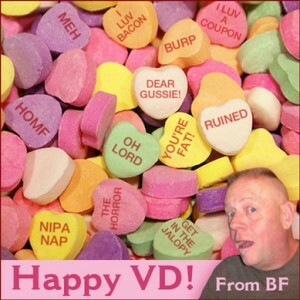 The Fat One sends our VD love to everyone with today’s LITTLE show that tells about a movie he watched, the coupon and some giftettes. Happy National Creme-Filled Chocolates Day. Special thanks to Miss Lauren for today’s and yesterday’s special artwork. Posted by Big Fatty in Podcasts on February 14th, 2019 ‌ Both comments and pings are currently closed. Mister Rogers was my show as a child. Growing up in a bad home, mister Rogers was the one who made me feel like I mattered. When you’re five and not receiving that validation from a parent, that 30 minutes a day was the best feeling. Happy Valentine’s day to you! Hope it was very sweet! Hug Poodle & Squeeze Squeaky Kitty!